New press images of the much awaited Samsung Galaxy Note 8 have surfaced. The new leaks show the almost bezel-less look display with a Dual camera setup. The new leaks also show the Galaxy Note 8 in a new Golden color. The Samsung Galaxy Note 8 is the upcoming Note series flagship from Samsung. The phone will come with the signature S-Pen and Bixby support. Other rumoured features are Exynos 8895 chipset and 6GB RAM with 128GB ROM. Famous leakster Evan Blass, @Evleaks has leaked the new image of Samsung Galaxy Note 8 on twitter. The images clearly show a Dual camera module placed at the upper-center of the Note 8. Net to the camera, we can see a LED flash and fingerprint sensor. The S8 was also criticized by many for its rear-mounted fingerprint sensor, and now we see the Note 8 walking down the same road. It is also speculated to have a heart-rate monitor at the back panel. Coming to the front, we have a bezel-less infinity display, much like the Galaxy S8. It is expected to be 2.5D curved glass Super AMOLED display with 18.5:9 aspect ratio. Atop the display, the front-facing camera, Iris Scanner, earpiece, and sensor array embellish the Galaxy Note 8. In terms of design, the render seems sleek and premium. 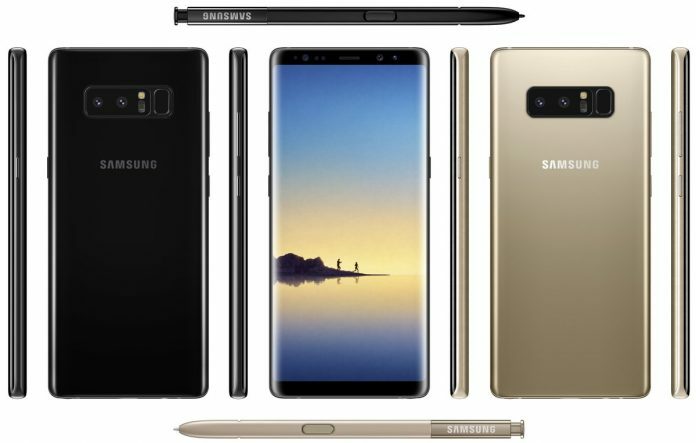 The Samsung Galaxy Note 8 leaks have surfaced in a new Golden color as well. With the power button on the right side and Volume Rockers with Bixby Button placed on the left, the phone speaks functionality. An image of the S Pen is also there among the leaks. The S-Pen seems to be color matched for both Black and Golden color variants. It bears the same ergonomics as the existing S-Pen. Surrounded by rumours, many specs of the Galaxy Note 8 are now out. The phone is said to come with a 6.4-inch QHD Super AMOLED display. It is expected to have a Dual camera setup with two 13MP lenses with independent OIS. In terms of hardware, the Note 8 is expected to pack a Samsung Exynos 8895 processor, with 6GB RAM and 64GB/128GB storage variants. It may retain 256GB expandable storage via microSD card. It may come with Samsung’s Grace UI and Android 7.1 Nougat. We may also see Bixby voice assistant on the Note 8.